The legal restrictions for getting an abortion in certain states are getting tighter and tighter, but new laws aren’t the only obstacle women face when they are looking to end a pregnancy. Across the country, there are simply fewer places for them to go. 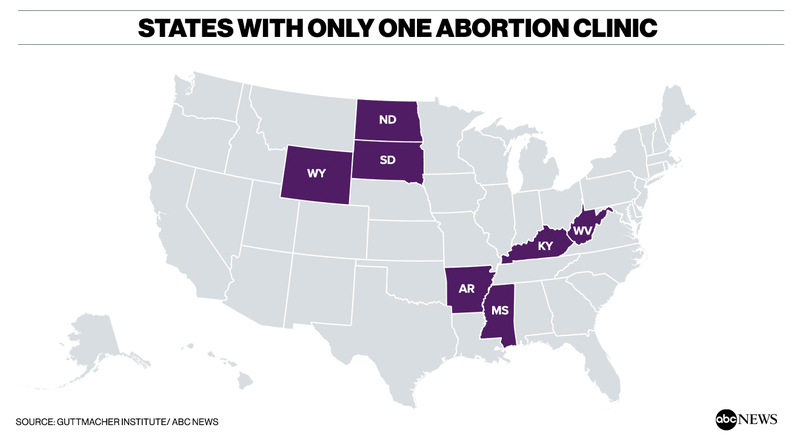 Iowa, Louisiana, and Arkansas are three states where multiple abortion clinics have closed in recent years, and now those states are also rolling out new laws shortening the time frame that women have to seek legal abortions. 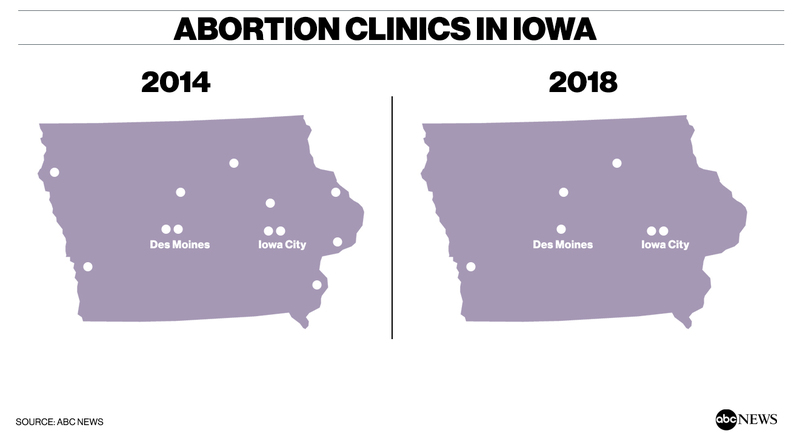 In Iowa, 11 clinics have closed or stopped providing abortions in the past eight years. Louisiana has only three clinics in the state that perform abortions, down from seven. And in Arkansas, a recent court decision means that instead of having three abortion-providing clinics, the state will have just one. 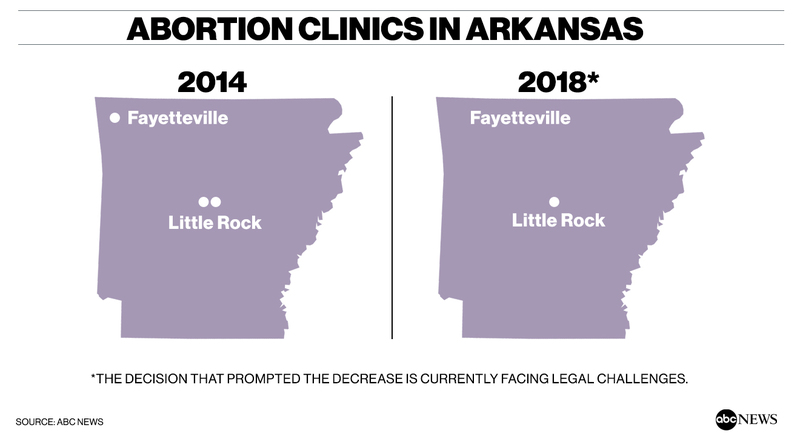 “Arkansas has always been a hostile state toward abortion and with the new administration, it’s kind of emboldened state legislators to continue to make regulations to limit access,” Dr. Stephanie Ho, an abortion provider in Arkansas, told ABC News. But Arkansas isn’t the only state where just one clinic is still operating amid heightened restrictions. Seven states now have only one abortion clinic: West Virginia, Kentucky, Mississippi, North Dakota, South Dakota, Wyoming and Arkansas, thanks to the Supreme Court’s decision not to reverse the lower court’s ruling there. That means women seeking abortions may need to drive hours to be able to access care. The Guttmacher Institute, a reproductive rights research group that was initially formed under Planned Parenthood but has been operating separately for years, tracks the number of abortion clinics. It hasn’t released data for all states since 2014, but policy analysts were able to share information on some of the states where a significant number of abortion facilities have closed. Those states include Texas and Arizona. In 2011, Texas had 46 abortion clinics and Arizona had 15; since then, the number of clinics in both states has dropped to less than half that. Planned Parenthood is fighting the Arkansas law that bans medical abortions, which are administered in pill form and don’t require women to undergo a surgical abortion. The two Planned Parenthood clinics in the state –- in Fayetteville and Little Rock –- offered only medical abortions, so when an earlier court ruling to ban them was bounced back by the Supreme Court, that left only one private clinic, Little Rock Family Planning, offering surgical abortions. Ho, a doctor who works at the Fayetteville Health Center run by Planned Parenthood, said there were women scheduled to have abortions on May 29, the date that the Supreme Court declined to take up an appeal of the Arkansas ban on medical abortions. The women had to be turned away because the ruling went into effect immediately. A new law in Iowa, the so-called “heartbeat bill” signed by the state’s Republican governor in May, is widely viewed as the nation’s most restrictive abortion law. It mandates that women cannot have an abortion after a fetal heartbeat is detected, which can be as early as six weeks, a time when some women don’t even know that they’re pregnant. According to the Des Moines Register, a district court judge granted a temporary injunction against the law on June 1, meaning that it would not go into effect until after an ongoing challenge lawsuit is resolved. The heartbeat bill, however, isn’t the legislation that prompted the closure of multiple clinics in the state. Erin Davison-Rippey, the executive director for Iowa at Planned Parenthood of the Heartland, said that until the 2016 election, a political balance existed between the Republican-controlled state House of Representatives and the Democratic-controlled state Senate. 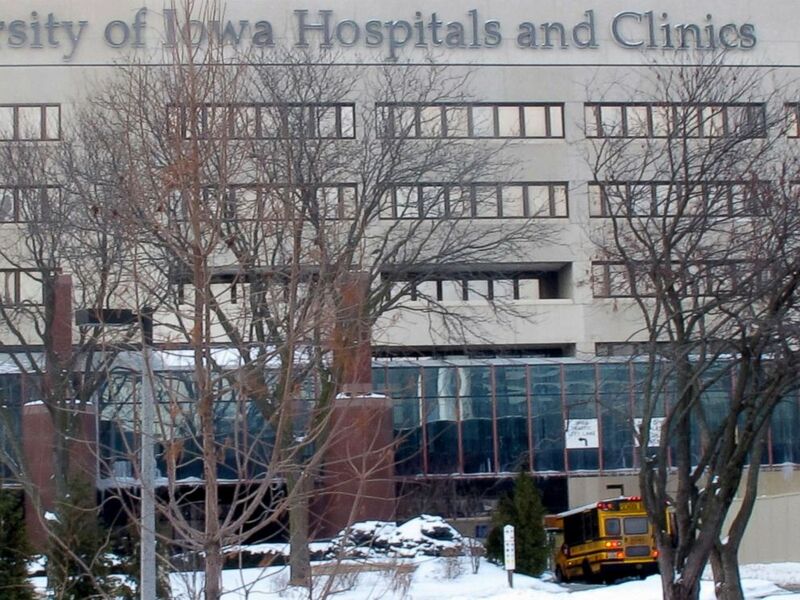 In this Feb. 13, 2014 photo is the University of Iowa Hospitals and Clinics in Iowa City, Iowa. A major change came in 2017 when the Iowa state legislature changed the state’s family planning program to no longer pay for any services at facilities that provide abortions, even though federal funding cannot be used to pay for abortions anyway. “Because patients were no longer able to use that program to access services at Planned Parenthood, we were forced to close four health centers in the state of Iowa,” Davison-Rippey said. “It was absolutely devastating. It’s devastating for the patients in that community for whom many had no other option. It was devastating for the folks who work at those health centers,” she said. Few political issues remain as polarizing in the United States as abortion, and many opponents of abortion see the closure of clinics as a step toward their ultimate goal of ending the practice. “Every time an abortion clinic shuts down, that’s something we celebrate,” Eric Scheidler, the executive director of the Pro-Life Action League, told ABC News. “If we’re right about abortion, that abortion takes the life of an innocent human being at its earliest and most vulnerable stage of life … then any time a facility shuts down that specializes in aborting those lives, that’s something we celebrate,” he added. “In many cases, when an abortion clinic closes, that’s a community that no longer has that injustice taking place in its midst,” Scheidler said. That sentiment is shared by Cheryl Sullenger. She pleaded guilty and served more than two years in prison for bombing an abortion clinic in California in 1987, according to the Los Angeles Times. Now she is the senior vice president of Operation Rescue, a group that touts the “investigations” it conducts of abortion clinics across the country. “It’s a relief to me because I know that when an abortion clinic closes, a lot of women realize that they really don’t want an abortion,” Sullenger told ABC News. “Some women regret their decisions, but I’ve never heard a woman come to me and say, ‘I wish I had a chance to kill my baby.’ Usually, women are pretty thankful that they didn’t,” she added. While the role of legislation in forcing clinics to close differs case by case and state by state, both sides agree that the Trump administration has been good for anti-abortion activists. Danielle Wells, assistant director of state policy media for Planned Parenthood, had a similar take. Wells said the “uptick in legislation that’s hostile to women’s reproductive rights and health” really started in 2011, following the election of a number of members of the Tea Party movement in 2010, but legislators have taken it even further. “What we’re seeing now is state politicians are really pushing the envelope in really a more extreme way,” Wells told ABC News, citing the Iowa “heartbeat bill” and bans passed recently in Mississippi and Louisiana on abortions after 15 weeks. 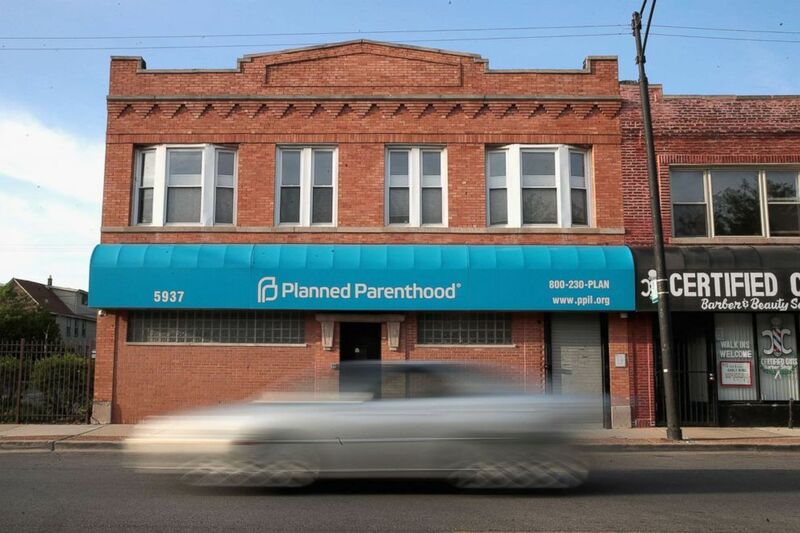 A motorist passes a Planned Parenthood clinic, May 18, 2018, in Chicago, Illinois. But Scheidler said one of the biggest impacts the Trump administration could have is in supporting such legislation if it is challenged on the federal level. “There’s a sense that the Justice Department and solicitor general will be less hostile to any court challenges, and related to that, there’s an anticipation that the courts, through Trump appointees, are becoming more sympathetic,” he said. Sullenger said she feels similarly and thinks it’s a good sign for the future of anti-abortion activism. “It’s an attitude change in this administration over previous administrations, so we’re very, very encouraged by that, but we don’t think as though we’ve won everything yet,” she said. “If the Trump administration stands for life, which they have been doing, that stands as an example as far as an educational moment for the American people,” she said. For Wells, these restrictions are just the latest attempt to block women from obtaining the care they need and are legally entitled to. “Unfortunately, we’ve seen restrictions on access to safe, legal abortions before. That’s nothing new. The Trump-Pence administration has essentially poured kerosene on that fire and we’ve seen state politicians looking to enact more extreme policies as a result,” Wells said.